Although Supplement II to OD&D was entitled Blackmoor, the book described very little of the setting of Dave Arneson's fantasy campaign. That task was taken up by The First Fantasy Campaign, published by Judges Guild in 1977. Part gazetteer of Blackmoor and its famed dungeon and part rules supplement, FFC is a remarkable peek into another take on D&D, one very different than the Gygaxian paradigm that most of us, consciously or unconsciously, take to be its native idiom. For those of us in the old school movement, this is an invaluable document, not just for the information it provides about the earliest campaign setting in the history of the hobby, but also for the way it presents another way to play OD&D, making Arneson the patron saint of rules modders and home brewers. The First Fantasy Campaign begins, appropriately enough, with an overview of "Blackmoor, the Campaign," which was a series of wargames scenarios that provided the backdrop for the setting. FFC includes extensive army listings for all the various forces involved (Egg of Coot, Duchy of Ten, Great Kingdom, etc. ), including notes about their incomes and costs of upkeep. There's also an overview of domain management -- constructing roads and bridges, laying down sailing ships, exploration, farming, fishing, and much more. It's a fascinating reminder that D&D's roots are in wargaming and not just in a vague "it's about killing bad guys and taking their stuff" sort of way. As presented in this book, Blackmoor was at least in part an honest-to-goodness exercise in strategy and tactics by the players, as the armies of good and evil contended to determine the fate of the northern provinces of the Great Kingdom. Unfortunately, for all this information, it's unclear what rules set Dave and his players used to adjudicate these battles. One assumes Chainmail but that's not a certainty. FFC continues with descriptions -- but no stats -- for "Blackmoor's More Infamous Characters." These characters include heroes and villains alike, at least some of whom, such as Mello and the Great Svenny, were PCs in the Blackmoor campaign. Following it is a description of Blackmoor Town, along with a map. Blackmoor Castle itself also gets a description, complete with a history and sketches of its "haunted rooms and the like," as the text calls them. After that, there is a large section devoted to the "outdoors in Blackmoor." This section includes methods for generating your own wilderness map and encounters that are similar to but differ from those included in OD&D. They're quite fascinating in their own right, but are even moreso for insights into the almost-improvisational way Dave ran and developed the Blackmoor campaign. This was not a campaign with a grand plan or story but one whose elements evolved through the rough and tumble of actual play, with luck playing as big a role as choice by players or referee. I found this section very fascinating. The "Blackmoor Dungeons" section begins with a brief historical overview of the dungeon (starting in Winter 1970). This is followed by discussions of notable inhabitants, such as Sir Fang the Vampire and the elves who maintain the barricades preventing the dungeon's inhabitants from terrorizing Blackmoor Town. Gamers used to a more straitlaced and serious approach to world building will no doubt find much that offends their sensibilities (turnstiles to enter the dungeon, holy water hoses, souvenirs, etc.) and I'll admit that it's a fair bit more over the top than I'd ever use in my own campaign. But one must remember that Blackmoor predates all the conventions we've come to associate with fantasy gaming; its participants were creating it on the fly, drawing on every inspiration available to them and without regard for concerns other than having fun. I think we need reminders from time to time that the true origin of our hobby is fun and all the philosophizing and debating in the world is but straw in comparison. Two dungeons are included in FFC. The first is Castle Blackmoor itself, consisting of 10 levels, although the text indicates that there are at least 15 more levels beyond what is described. These levels each get a map and key, along short entries detailing monsters and treasures. The second dungeon is a small one beneath Glendower, which consists of only four levels. Both dungeons are not highly detailed and their maps are more like sketches than exhaustively drawn works of cartographic art. Again, many gamers might be disappointed with these maps, but to expect precision from them is, I think, to misunderstand the nature of early gaming, which was much more "seat of the pants" than many realize. Notes were kept but they were brief, intended to jog the memory more than anything else. This section of FFC reflects that. The final portions of The First Fantasy Campaign are a grab bag of rules and ideas: magic swords, Gypsy sayings and chance cards, a discussion of how the OD&D magic system is interpreted in Blackmoor, the "wine, women, and song" rules for earning experience points for gold. There are also maps of Svenson's Freehold, expanded rules for dragons, vampires, and other creatures, among other tidbits. FFC truly is an eclectic product. What I think is most notable and praiseworthy about The First Fantasy Campaign is the way it preserves and communicates, warts and all, what it was like to play at the dawn of the hobby. The rules presented here are quirky and flavorful, one part Chainmail, one part OD&D, and one part imaginative improvisation. The setting itself is highly impressionistic. Macro details are few and far between; most of the information pertains to individual locations within the setting, with the implication that other information will be created as needed rather than determined in advance of use. As I've gotten older, I've come to appreciate this style of gaming much more than I would have in my youth. Consequently, I am sure that many will look on FFC with some disappointment at its seemingly random approach to a variety of topics, including world building. For me, though, that's part of its charm. This most emphatically isn't a polished product or an attempt at brand building. It's the notebook of one highly imaginative and eccentric referee, offered up for the world to see rather than to pick up and use "out of the box." Like OD&D itself, using The First Fantasy Campaign for onself is an exercise in active engagement with the text rather than simply reading it and following its instructions. There are no instructions in this book, just as there were no instructions to OD&D. Each person who reads it must of necessity make of it what they will. Like Dave Arneson himself, it's a pity more people aren't familiar with this product and its unique approach. I think the hobby might have been a very different place if they had been. I think we need reminders from time to time that the true origin of our hobby is fun and all the philosophizing and debating in the world is but straw in comparison. I really think a lot of grognards need to remember this. While I truly appreciate the encyclopedic knowledge of the rules a few grogs have, I just can't buy into slavish devotion to them as somehow necessary to have, well, fun. Something Gary, Dave, Frank and others were remarkably consistent about was their "whatever works" approach to DMing and rules. I know your post was more about the elements of the game and use of humor, but it made me think of how nutty some of us get about "The Rules." It's a game, not holy writ. Whatever works for your table is good, if it means you're having fun. I'd love to have this for the historical value. Sadly they are rare and expensive when found. At least in my experience. This, and Hargrave's Arduin Grimoire, are my "go to" texts for inspiration. My copy of FFC is so well read that it's lost its cover, but that doesn't stop me reading through it every now and again when I need an inspirational boost. Growing up I knew little of Greyhawk or the Forgotten Realms, it was Blackmoor and Arduin where my imagination sought refuge and fuel. 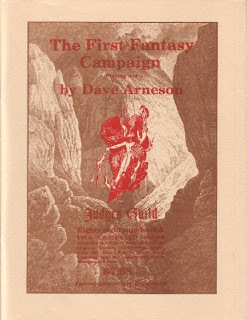 One of Arneson's posts on the OD&D discussion boards indicated that he was working with someone to "clean up" the original FFC for a free pdf download. I can only hope that it surfaces someday. I'd *really* like to have it. Thanks for the timely review. Given that WOTC has pulled its support for old PDFs, would you mind reviewing the D20 Blackmoor some time? That may be the only viable purchasing option for many of us in the near future. I used to own a copy of this, years ago. At the time, I totally did not understand it at all, since I started with AD&D's highly organized and detailed ways of presenting modules and rules. After scratching my head for a while, I gave up and sold it. Boy, do I ever regret that now. You make a great point about the humor, too. D&D games seem to have gotten much more Serious as I've gotten older, and I think that's a shame. Next time I run a campaign, I'll try to correct that. I have to confess that there's a fair chunk of FFC that still doesn't 'click' with me... but each time I read it , a little more does that didn't before, so I make sure to pull out my copy and re-read it on a regular basis. I recently acquired this, and was delighted to see that my old gaming circle and I had been 'doing it right' all along. My allegiance had always been more Arnesonian, as well, and so my thoughts go out to Dave and his family. FFC sounds great, unfortunately it doesn't seem to be available on rpgnow. Hm. I'd like to read this. It sounds interesting. Definition: adjective, crafted of iron harvested from smelting Fool's Gold. It's unlikely to be on rpgnow any time soon. If I recall the rights to it exist in kind of a limbo between Arneson (his estate now I presume) and Wizards of the Coast. Absolutely. It's vital to be reminded of this regularly. I only have a couple of the releases from the D20 line and, given that I was involved, if only tangentially, in some of the later ones, I'm not sure I can do so with any objectivity. The new Temple of the Frog, for example, is not book it could have or should have been and the published version is quite different than I'd hope it would be. God speed Mr. Arneson. You will be missed. Just received my copies of First Fantasy Campaign and the d20 Blackmoor books. A very interesting dichotomy between the two books. FFC is like being given a copy of a DM's notebook. A lot of neat (very neat) stuff, but also a lot of stuff where you get the impression that you're "missing something". However, it also really gets the creative juices flowing. It is the sort of book where you go "well I don't get where he's going with this, but I can totally steal this idea or that map." I haven't had as much time to go through the d20 Blackmoor book as yet. It is clearly the more polished book. There is a decent amount of history in there. However, it also seems a bit tougher to customize, to make it one's own. What I'd love to see are more books that are kind of in the middle. Good presentation, good editing like newer products. But more of a toolbox sort of approach like you find in products like FFC. I keep Looking for FFC on ebay as my older sister threw it out when she got mad at me many many moons ago. I used it as my setting. Every one else in our group played the Giants Modules but when I wanted "Something special" it was FFC and Blackmoor, Holy Water firehoses and all.I was in the Rules-Schmules even Gygax said they are Guidlines and the DM is the final arbiter. Arneson's world had the right amount of High Fantasy and Monty Python hijinks that made every session a total fun fest as opposed to Monty haul and slaying of the Orcs. the Egg of Coot was my (anti-hero). Seat of the Pants, make it up as you go along (though adapting it to AD&D instead of using Chainmail) style DMing was the order of the day. Dave, you will be missed..Your imagination spurred mine and helped create many fond memories.